Indiana State University will be recognized in two venues this month as one of 20 colleges and universities nationwide that exemplify the mission of the American College and University Presidents' Climate Commitment (ACUPCC) to re-stabilize the earth's climate through education, research and community engagement. The "Celebrating Sustainability" series highlights the sustainability initiatives of finalists for the 2013 Second Nature Climate Leadership Awards. Second Nature, a national nonprofit that works to create a healthy, just and sustainable society by transforming higher education, will formally recognize ISU on the ACUPCC and Second Nature websites on April 18. In tandem with the series, Indiana State is vying for the top spot in a public video voting competition. ISU has produced a video that promotes the campus's sustainability initiatives, and viewers will have the opportunity to vote for the most innovative and groundbreaking institution in each Carnegie Classification. Voting takes place throughout April in partnership with Planet Forward: http://planetforward.org/climate-leadership-awards-2013/. Indiana State University has been working towards sustainable solutions since 1989 with its world-class recycling center and conversion from a coal burning boiler facility to an award-winning natural gas boiler facility. Most recently, the university has stepped up its commitment to sustainability by signing the ACUPCC in 2007, creating a climate action plan, conducting carbon footprint analyses, joining the Advancement of Sustainability in Higher Education in 2012 and starting on Sustainability Tracking Assessment and Rating System reporting in 2013. This effort is capped by the University's dedication to sustainability by funding the Institute for Community Sustainability in February of 2012. "It takes commitment of time, will, and resources to make inroads on sustainability, and Indiana State University has put forth all of the above with the establishment of its Institute for Community Sustainability," said David Hales, president of Second Nature. "The ICS, true to its name, has partnered with local grassroots organizations to help create a sustainability plan for its larger community. This kind of collaboration has the power to propel a community forward in its addressing of climate change." "The institute joins together our campus sustainability efforts, creates ties with community partners, and makes sustainability part of our experiential learning and community engagement curriculum," said Jim Speer, director of the Institute for Community Sustainability. "ISU's investment in the Institute for Community Sustainability through the Unbounded Possibilities initiative is a great step forward, demonstrating our commitment to sustainability. This also positions ISU well for being a local leader in sustainability efforts." 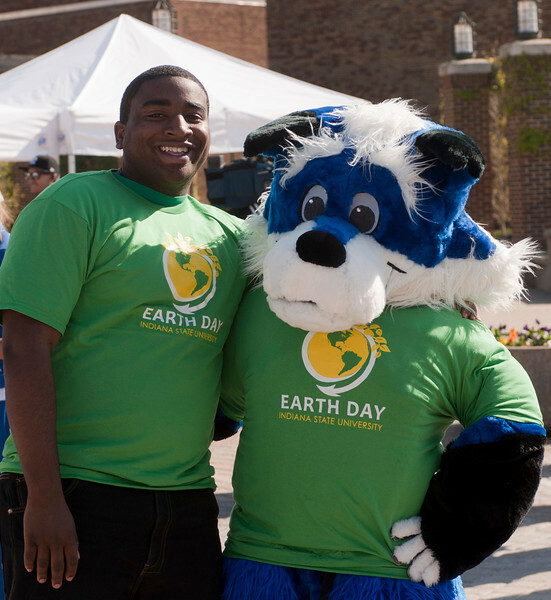 ISU vies for popular vote in Earth Month video competition.